While doing the waterbird count at Larnaca Sewage Works this morning, I remarked to another birder there that this time last year a Terek Sandpiper had been found at the Sewage Works. An hour later at Oroklini Marsh the first bird I saw from the hide was this Terek Sandpiper! Not annual here this would be the 15th Cyprus record of the species since 2000 if accepted. Sorry for the awful photos but it was just too far for anything decent. Categories: Birding | Tags: Black Kite, Black-headed Wagtail, Black-winged Stilt, Common Kingfisher, Common Ringed Plover, Curlew Sandpiper, Cyprus Birding, Cyprus birds, Cyprus birdwatching, Dunlin, Eurasian Thick-knee, Ferruginous Duck, Greater Flamingo, Gull-billed Tern, Larnaca birding, Larnaca birdwatching, Laughing Dove, Little Ringed Plover, Little Stint, Marsh Sandpiper, Oroklini Marsh, Spur-winged Lapwing, Terek Sandpiper, Whiskered Tern, White-winged Tern | Permalink. The area is drying out but along with Larnaca Sewage Works, it is still probably the best birding location on the island at the moment. Plenty of Little Ringed Plover (see photo), Kentish Plover and Little Stint along with Glossy Ibis, Slender-billed Gull, a Broad-billed Sandpiper, a Spotted Redshank, Common Greenshank, Common Snipe, two Collared Pratincole, a Temminck’s Stint and a Gull-billed Tern. A female Western Marsh Harrier is putting the birds up frequently as she quarters the area and Elenora’s Falcon fly over from time to time. Categories: Birding | Tags: Akrotiri birds, Akrotiri Salt Lake, Broad-billed Sandpiper, Collared Pratincole, Common Greenshank, Common Snipe, Cyprus Birding, Cyprus birds, Cyprus birdwatching, Eleonora's Falcon, Glossy Ibis, Gull-billed Tern, Kentish Plover, Little Ringed Plover, Little Stint, Slender-billed Gull, Spotted Redshank, Temminck's Stint, Western Marsh Harrier | Permalink. One of several juvenile Yellow-legged Gull currently to be found along Spiros Beach and Larnaca Sewage Works. Also in the area today were an Eleonora’s Falcon, Little and Gull-billed Tern, Temminck’s and Little Stint, Dunlin, Ruff, Little Ringed Plover and Greater Flamingo. Categories: Birding | Tags: Cyprus Birding, Cyprus birds, Cyprus birdwatching, Dunlin, Eleonora's Falcon, Greater Flamingo, Gull-billed Tern, Larnaca birding, Larnaca birds, Larnaca birdwatching, Larnaca Sewage Works, Little Ringed Plover, Little Stint, Little Tern, Ruff, Temminck's Stint, Yellow-legged Gull | Permalink. A record photo of one of four Gull-billed Terns at the Sewage Pools this morning. Three other tern species also present – seven Little Tern, one Whiskered and one White-winged Tern. Black-winged Stilt and Spur-winged Lapwing had chicks of varying sizes. On the water there were five Ferruginous Ducks in with the Mallard and around the edge there was a Little Ringed Plover, a Common and Green Sandpiper and some Kentish Plover. I only saw the best bird as I drove up to the hide – a Osprey was being chased over the area by Hooded Crows and heading east. A juvenile had been reported there towards the end of June and I guess it may well be the same bird. Categories: Birding | Tags: Black-winged Stilt, Common Sandpiper, Cyprus Birding, Cyprus birds, Cyprus birdwatching, Ferruginous Duck, Green Sandpiper, Gull-billed Tern, Larnaca birding, Larnaca birdwatching, Larnaca Sewage Works, Little Ringed Plover, Little Tern, Osprey, Spur-winged Lapwing, Whiskered Tern, White-winged Tern | Permalink. Just had 30 minutes to spare yesterday and today in the hide overlooking the Sewage Pools but managed a few decent birds there after a quiet couple of weeks. Two long staying Grey Heron and the breeding Spur-winged Lapwing, Mallard, Coot and Little Grebe have been joined at some stage by a White-winged Tern, up to seven fishing Little Tern, a Gull-billed Tern, an adult Slender-billed Gull, two Little Ringed Plover and up to six Black-winged Stilt. Feeding on caterpillars in the bushes along the fence line are an adult (photo) and a juvenile Great Spotted Cuckoo. Categories: Birding | Tags: Black-winged Stilt, Cyprus Birding, Cyprus birds, Cyprus birdwatching, Great Spotted Cuckoo, Gull-billed Tern, Larnaca birding, Larnaca birdwatching, Little Ringed Plover, Little Tern, Slender-billed Gull, Spur-winged Lapwing, White-winged Tern | Permalink. 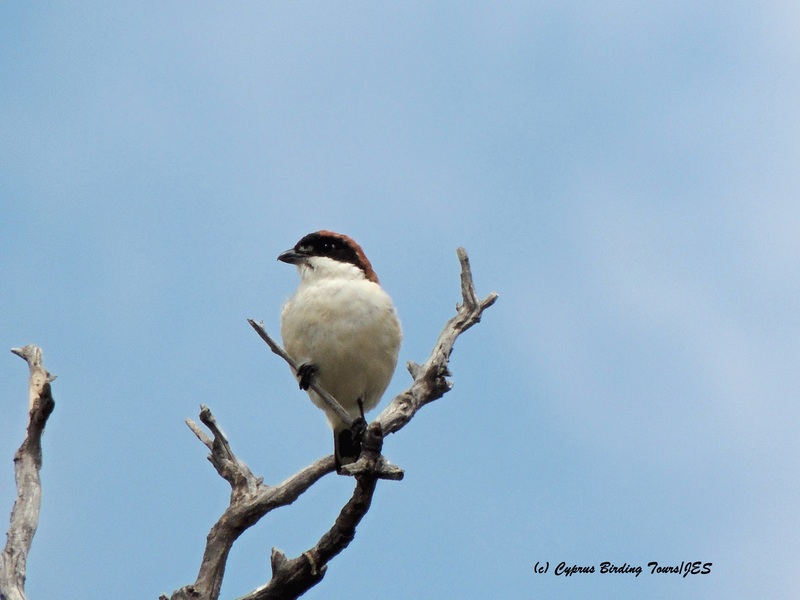 This year a day out in mid-May means finding very few passerine migrants, the need to concentrate on breeding birds and visiting a wetland to increase the variety of species seen. Luckily Robert had a list of realistic target species which made our day easier although we had to work hard to find the Black-headed Wagtail. The other species Robert hoped to see were Cyprus Warbler, Cyprus Wheatear, Black Francolin, Chukar, Little Owl, Spur-winged Lapwing and Masked Shrike. Starting at Cape Greco, the first bird we saw was a singing male Cyprus Warbler which was a great start. We explored the area and found another two males and two females together with a couple of juveniles. We soon heard the distinctive call of the Cyprus Wheatear and spotted a singing male on a low bush. Several others were later seen as were a couple of European Turtle Dove, a Spectacled Warbler, a male and female Red-backed Shrike as well as a couple of Sand Martin. A couple of Black-headed Buntings were singing near the Sea Caves area where we also found our only Chukar of the day. We then headed to Akhna Dam where several Spur-winged Lapwing were found as was a male Garganey, a couple of Ruff and Common Sandpiper, some Little Egret, a Grey Heron and a Glossy Ibis. Several Eurasian Reed Warbler were heard singing and a flock of around 30 Common Swift and seven Alpine Swift were flying over the area and coming down to drink – a great sight. We visited both hides at Oroklini and Robert got great views of another of his targets here – this time a male Black Francolin was out in the open calling for quite a while. We also saw more Spur-winged Lapwing here as well as Black-winged Stilt, Curlew Sandpiper, Ruff, Wood Sandpiper, Little, Whiskered and White-winged Tern and Garganey. There were several recently hatched young Cattle Egret in the colony and we also spotted a Spur-winged Lapwing chick with one of its parents. We then went inland to Panagia Stazousa to try and find a Masked Shrike and a Little Owl. We found the Little Owl perched outside its nest site but it took a while to find a Masked Shrike until eventually a male flew into view. We also saw more Cyprus Warbler and Cyprus Wheatear as well as Olivaceous Warbler, a European Roller, a fly-over Eurasian Hobby and two Long-legged Buzzard. We heard Cretzschmar’s Bunting but couldn’t get decent views of them. Our next stop was on the eastern side of Larnaca Salt Lake where there was still some water and I was hoping may be a suitable location for the feldegg race of the Yellow Wagtail – Black-headed Wagtail. We found some water and the bonus of three Broad-billed Sandpiper (a regular but scarce passage migrant to Cyprus) feeding with Black-winged Stilt, Spur-winged Lapwing, Little Stint, Ruff, Wood Sandpiper and some stunning Curlew Sandpiper. A Squacco Heron was also present and we heard the call of a Yellow Wagtail and saw a couple fly over but were unable to see which race they were. 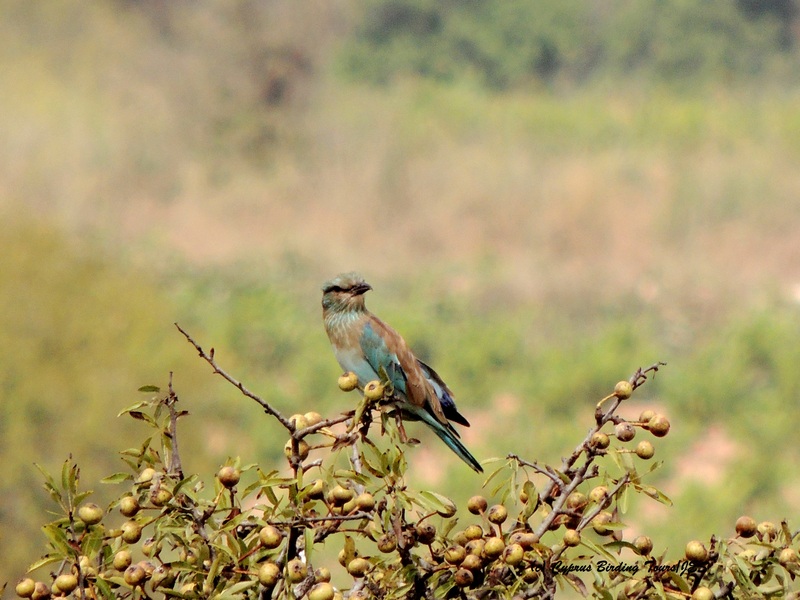 Finally, a male Blue-headed was spotted feeding next to some reeds and then to its right there was a male Black-headed. All of the target species seen we went south of the airport to see what was on the Sewage Pools there. There were several Little Tern and a couple of White-winged Tern as well as two Yellow-legged Gull, some Spur-winged Lapwing and several Ruff. New birds for the day were a single Gull-billed Tern feeding over the water and a Collared Pratincole which we saw head out towards the coast. We finished our day there pleased with our efforts. Categories: Cyprus Birding Tours Trip Reports | Tags: Black Francolin, Black-headed Bunting, Black-headed Wagtail, Black-winged Stilt, Broad-billed Sandpiper, Chukar, Collared Pratincole, Cretzschmar's Bunting, Curlew Sandpiper, Cyprus Birding, Cyprus birds, Cyprus birdwatching, cyprus trip reports, Cyprus Warbler, Cyprus Wheatear, Eurasian Hobby, European Roller, European Turtle Dove, Gull-billed Tern, Laughing Dove, Little Owl, Little Tern, Long-legged Buzzard, Masked Shrike, Red-backed Shrike, Spur-winged Lapwing, Whiskered Tern, White-winged Tern | Permalink. Spent today out in the Paphos area. Rain was a pleasant relief from the heat when I got to Arodes but it didn’t put off both the Long-legged Buzzard and Eurasian Hobby that were flying over the area. There were at least four European Roller in the area and two Eurasian Turtle Dove. Off shore I saw thirteen Grey Heron, three Little Egret, at least 75 Glossy Ibis, around fifty Garganey and six Gull-billed Tern as they migrated over Polis Chrysochou Bay. A Woodchat Shrike was at Neochorio and Masked Shrike were at Androlikou and Minthis Hills with several European Roller at both those locations. A quick visit to Paphos Sewage Works on my way home produced 12 migrating Yellow Wagtail . Categories: Birding | Tags: Cyprus Birding, Cyprus birds, Cyprus birdwatching, European Roller, Garganey, Glossy Ibis, Grey Heron, Gull-billed Tern, Latchi, Little Egret, Long-legged Buzzard, Masked Shrike, Paphos birding, Polis Chrysochou Bay, Woodchat Shrike, Yellow Wagtail | Permalink.